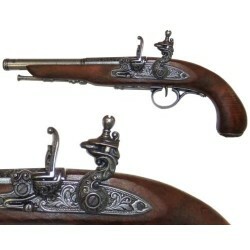 Reproduction of the flintlock pocket gun manufactured by Kumbley & Brum in London in 1795. Made of metal and ivory imitation on the plastic handles, with simulated mechanism of loading and firing. 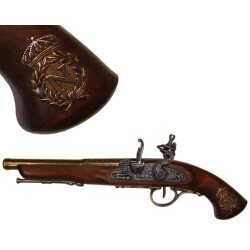 The flintlock pistols were made in a great variety of sizes and styles. The smaller ones were less than 6 inches long, fit in a pocket and could easily be worn by women.